I feel ecstatic whenever I talk about yoga and meditation for many reasons. For instance, did you know that yoga can alleviate depression, anxiety, insomnia, fear and even help with weight loss and self-esteem by reducing the physiological manifestations of stress? This is done by raising the levels of endorphins which are chemicals that our bodies produce as a feeling of well-being. Many wellness centers, mental health clinics and even out-patient programs that focus on mental health have yoga programs. Not that they want you to contort your body, but learn some basic exercises that can help ease tension and ground and relax you. Yoga can make you stronger and more flexible both physically and spiritually. To applaud yoga for its physical benefits alone would only diminish what this entire system has to offer as a whole. By practicing yoga on a regular basis, you may be surprised to find that you’re building much more than a strong, flexible body. This guidebook will simplify the ancient practice of yoga by showing you some basic yoga positions, giving you tips on performing yoga exercises, and inducting meditation practices into your everyday life. Through yoga and meditation, you can come to a new level of enlightenment with your personal life and enhance the quality of your existence. With this yoga practice you will burn calories as you become stronger and more flexible both physically and mentally. Download Yoga and Meditation Now! The same goes with meditation. 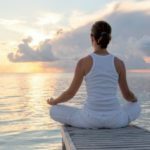 Studies at John Hopkins have shown that relaxation techniques such as meditation can help you cope with the stresses that contribute to depression, anxiety, fear, low self-esteem and yes, even weight loss. This view has also been supported by the Mayo Clinic as well as hundreds of studies world wide. The bottom line is learning how to relax is the perfect antidote to stress. The first thing you need to do is change your view about yoga and meditation. Keep in mind meditation is not just sitting on the floor with your legs crossed saying “om” and yoga doesn’t mean you have to contort you entire body. So here is what we are going to do. We are going to start building a daily routine which will be a series of things that you need to do daily as part of your practice and to break the cycle of despair. When I say daily I mean six days a week as I strongly believe that giving your self a day off from everything is good and in the end will help you avoid burnout. I personally think the first thing in the morning is the best time to do my daily routine before anything else, however, this is about you. So you think about what will work for you. The best time of day for me to focus on me is? Hello and welcome back. How are you doing right now? Keep checking in with yourself. It’s time to start the yoga and meditation as part of your daily routine. I want you to perform the poses in the order the book presented then, that you feel you can safely do as part of daily routine. As you get better you can add more. I would like you to build up to twenty minutes of meditation daily as well. For now start in intervals that will work for you. Now this may sound like a lot, but I’d also like you to add a daily walk. You might even want to walk with a partner. This is a great way to bond. It can be the same person or can change daily. It is a good, healthy free activity for partners, parent-child, dog and owner (the dog would love it) and old friends. It is a time when you can talk without the TV or phone distracting you. Remember to make both the yoga meditation and walk a daily habit if you can. The length of the walk will be determined by you level of fitness as well as time constraints, but I suggest trying for at least 20 minuets. Finally, if the weather is not conducive for walking outside I suggest going to the mall and taking your walk there. Let’s end here for now and come back tomorrow. Now with the walk, yoga and mediation working on helping reduce anxiety and stress it is time to go back to the Life Without Anxiety guidebook and go over some things that you felt you stumbled on or that you need to work on more to help you with your anxiety. I want you to feel confident about your progress on your anxiety. So start your routine and review Life Without Anxiety guidebook and be sure to actually write down your answers to activities and do not rush. If you need a break or are not focusing stop and come back to it later. On page 27 I want you to pick two of the suggestions and do them later today. This concludes week 2. When you take your daily walk be sure to walk in peace.